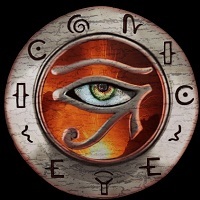 ICONIC EYE is a AOR / Hard Rock band from United Kingdom formed by Greg Dean as a studio project to record his favourite songs and after involved few musicians into this project. The album features 2 vocalists. At the beginning Lee Small (SHY) was bought in to do session vocals on five tracks and later the remaining seven tracks were completed by now permanent band member vocalist Tim Dawes. Debut album “Hidden In Plain Sight” will be released on Sky Rocket Records on May 3rd, 2015. Every song on this CD is created on the highest level. My favourite track on this album is “You Knew” where melodic Hard Rock riffs are so wonderful with powerful drums and catchy choir in refrain which catch listener's heart. I just love this melodic & memorable track! Also are delectable QUEEN influences here. I love also “Better Place” with fantastic changeable rhythmic section and melodic sounds. Amazing chorus with Progressive echoes and even little similarity to Hard Rockers SCORPIONS. “Here I Stand” is characterised by gentle singing, wonderful vocal connection with AOR bass & choir give amazing climate. Opening “Can Feel It” has nice keys in EUROPE style, amazing energy in VAN HALEN climate & impressive work of guitars. Catchy chorus singing in choir, lovely sounds, memorable, so enjoyable track which give true pure AOR song! Energetic opener in “Now That I've Found Love” with perfectly played powerful rhythmic section makes memorable sounds. This track gives many motivational & positive vibes! What a guitar solo, so excellent! Single “Let It Rain Down” has a calmer opener with piano and then higher style in refrain which has melodic and commercial vibes. Guitar solo is worth to listen. Working bass with climatic keys are in “Broken Dreams”. Here are also Bluesy riffs and in this rockin track has so stunning atmosphere! In “Every Little Thing” is noticeable experience of musicians. Here are fabulous keys, gorgeous rhythmic section, nice balsamic voice and guitar solo sound as a heaven. Worth to listen are: “All She Needed” with gentle climate, fabulous vocal and acoustic guitars sounds brilliant with electric one, “You Make It” with memorable sounds in '80 years and keys with VAN HALEN sounds and JOHN NORUM riffs, “You're on Your Own” with nice sounds in DEF LEPPARD style and catchy refrain and “Don't Stop Me From Leaving” with memorable refrain in calmer mood – I love these sounds! ICONIC EYE are connecting AOR with Hard Rock, modern sounds and Progressive elements in their work. In my opinion it is very enjoyable album in listening. Production is on high level. Listenable is maturity, experience and perfectness of band. The more I listened to this album, the more I liked it. Melody is pouring out from this CD; its elements are excellent played together. 10 killer songs from this album will be surely amazing gift for lovers of Hard Rock, fans of Hard Rock from '80 and AOR fans. Highly recommended.